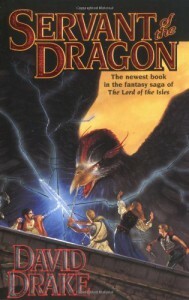 Servant of the Dragon is the third book in the Lord of the Isles series by David Drake and I am currently reading it. So far it is pretty good - with the same kind of elements found in the prior books. Huge problems are discovered and then solved with suprising ease. However, both Sharina and Cashel have both found themselves in interesting lands with difficult problems to solve so I hold out extra hope for this book.One of Drakes best traits in these series is his inventive characters and cultures and this book so far has introduced me to at least two new ones. The Dragon's and a Bird guy, Dalar, whose name I can't remember at the moment. Finally, Drake also has a cool habit of allying suprising characters such as demons with the heros. It tends to set any preconceived notion you might have about the term demon on it's ear when one suddenly starts helping to save the world - even if it is for a selfish reason and not a noble one.Well I finished the book and so far it was my favorite in the series. Each of the characters went on completely different patters in their quests and amazingly all ended up in the center of the same big problem. You don't really have to read the other books in the series to follow what is going on in this book; but I still recommend reading the whole series. However, if you don't have the time for all three books - just skip to this one.